Starting with gas chromatography–mass spectrometry (GC–MS) and continuing through GCxGC–MS, LC–MSn, and LC–NMR–MS, hyphenated methods have revolutionized chemical analysis. This volume covers that revolution in two parts. The first (Chapters 1–4) describes principles, instrumentation, and technology, and the second (Chapters 5–10) organizes major application areas in GC–MS and LC–MS. After a general introduction (Chapter 1), attention is paid to principles and instrumentation of GC–MS (Chapter 2) and LC–MS (Chapter 3). 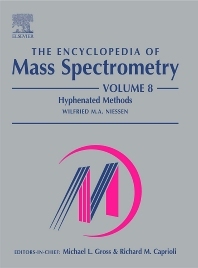 Other hyphenated methods, including online combinations of capillary electromigration methods and supercritical fluid chromatography with mass spectrometry, are in Chapter 4. Applications are then covered in the remaining chapters. The application-oriented chapters are focused on the role of mainly LC–MS in the pharmaceutical field (Chapter 5) and biochemical and biotechnological applications (Chapter 10), and the application of both GC–MS and LC–MS in relation to environmental analysis (Chapter 6), food safety and food analysis (Chapter 7), characterization of natural products (Chapter 8), and clinical, toxicological, and forensic analysis (Chapter 9). Advanced research scientists, mass spectrometrists, spectroscopists, analytical chemists, and those working in related fields.